As chairman of the Šiauliai Region during the Nazi occupation, my grandfather wrote more than 1,000 orders, of which about 100 concerned the oppression of Jews, usually the transfer of Jews from one location to another (round-ups) or the distribution of their property (plunder). This is just one of his orders. As a friend who has studied the Holocaust in Lithuania said, “It takes a village to commit genocide.” First some background on the Žagarė market square, the site of the killing, then the order translated in English, followed by the original order in Lithuanian with the signature of J. Noreika. In August 1941, the 14th Lithuanian Police Battalion was formed in Šiauliai to guard officer warehouses, industrial enterprises, and railroads in Šiauliai, Telšiai, and Plungė. They also helped transfer Jews to Žagarė and maintain order and control. On August 20, 5,566 people lived in Žagarė; 2,402 were Jews. 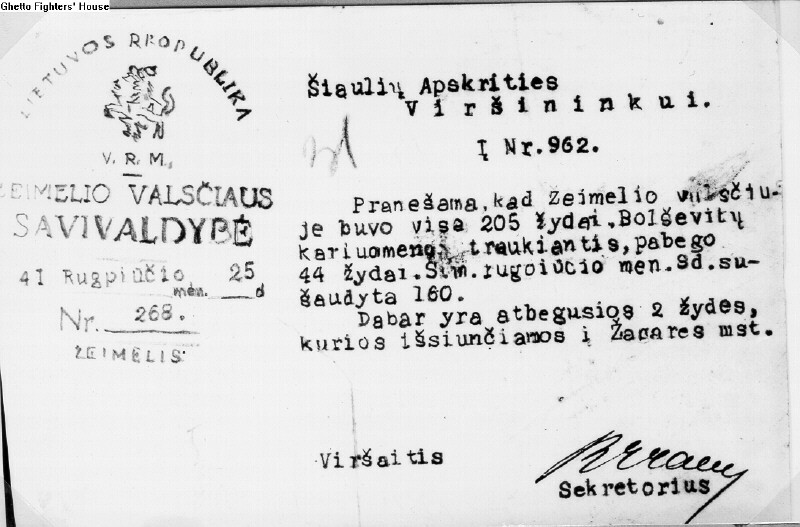 My grandfather ordered that all Jews and half-Jews be transferred to Žagarė by August 29; they were brought in from Šiauliai, Joniškės, Kuršėnai, Žeimelis, and other towns. Jews were allowed to leave the ghetto to chop wood in the forest. During the last days of August, the Lithuanian police battalion ordered Lithuanian residents to dig a ditch in the shape of the letter “L” (presumably L as in only for Lithuanians) in the city’s Naryškys Manor Park. On October 2, the German commandant ordered Jews to go to the market square, acting as if they would be led to work by lining them up and separating men from women, children, and elderly. He blew a whistle, and the area’s Lithuanian residents and Lithuanian police battalion surrounded the square. As the Jews panicked, they tried to escape and were shot. Wagons arrived to the market square so the bodies could be loaded, and brought to the waiting “L” pit where they were buried. But first, their money and clothes were removed. The remaining Jewish property was brought to Šiauliai. At the end of the day, 2,236 Jews were shot: 633 men, 1,107 women, and 496 children, then buried in the “L”. Žagarė’s mayor informed the Šiaulių district leaders that no Jewish property was left: six synagogues were confiscated, only torn prayer books remained; no Jewish stores, archives, or libraries left. Žagarė’s ghetto lasted from August to October 2, 1941. I was curious to see how the mayor responded. Below are the English translations followed by the original documents sent to my grandfather. I am letting you know that Žagarė’s city has allotted the Jews to live in 12,135 metric yards. At this time, there are 715 Jews. In fulfilling the Šiaulių Region Chair’s order Nr. 962 from August 22, 1941, I am letting you know that in Žagarė’s city, from today’s date, August 29, 1941, there are 949 Jews settled from other cities and villages. There is also a reply from the Žeimelis Parish Chief that 44 Jews had fled with the Bolsheviks and 160 remaining Jews were shot on August 9, 1941. Two Jewish women had subsequently run to the village and were now being sent to Žagarė. This document is very important because it directly links the killing of Jews to my grandfather. Here is an original order signed by grandfather asking for the transfer of Jews. Here is an original order signed by grandfather concerning the distribution of Jewish property. Here is the 32-page booklet “Raise Your Head Lithuanian!!! !” by my grandfather.